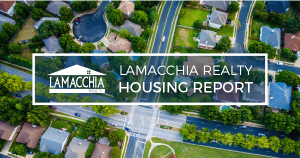 The Lamacchia Housing Report presents overall home sale statistics and highlights the average sale prices for single families, condominiums, and multi-family homes in Massachusetts and Southern New Hampshire for June 2018 compared to June 2017. It also looks at other metrics in Massachusetts like Homes Listed For Sale and Homes Pending, as they are often the best indicators for predicting future trends in the market. 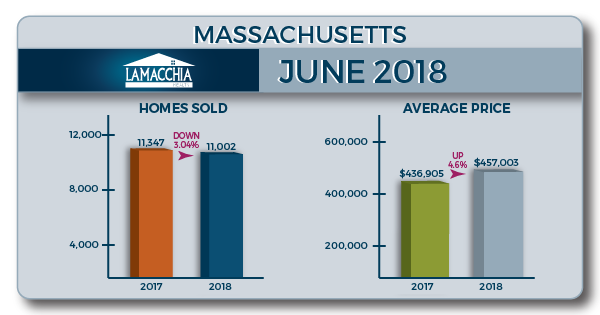 Massachusetts home sales decreased in June 2018 from June 2017 by just over 3% in all three categories. Single families decreased in sales by 3.57% from the year before. 7,473 were sold in June 2017, compared to 7,206 this year. Condos decreased by one and a half percent with 3,007 in June 2017 to 2,962 in 2018. Multi-families decreased by 3.81% from 867 in June 2017 to 834 in 2018. Overall, prices increased by 4.60% in June 2018, from $436,905 in June 2017 to $457,003. Single families and multi-families saw increases in prices, but condos fell. Single families increased by 4.70%, up to $496,487 from $474,216; multi-families increased by seven and a half percent, now up to $512,025 from $476,308. Condos fell slightly, by .16% with prices moving from $359,294 to $358,711. In June 2017 11,364 homes were listed for sale in Massachusetts compared to 11,698 in 2018, showing a 2.94% increase. This depicts the market continuing its swing into balance, as more homes are available on the market. There were 10,669 homes that went pending in June 2017 and 10,619 in June 2018 showing a .47% decrease. Like last month which also had a slight decrease in pending sales. This is because inventory was much lower all winter and spring mostly due to scared sellers. In addition in late June as a result of inventory finally rising, homes aren’t selling as quickly now that more homes are available. Now that we are into summer Buyers usually have a little more time to make offers. 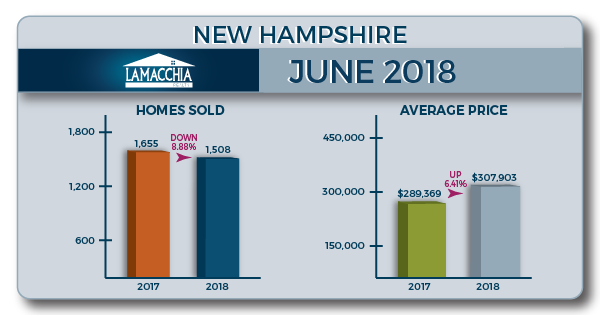 The number of properties sold in Southern New Hampshire decreased overall by 8.88% from 1,655 to 1,508, with decreases in all three categories. Condos decreased by 11.49% going from 409 sales in June 2017 to 362 in June 2018. Multi-families family sales decreased by 11.11%, now at 64 from 72, and single families decreased by 7.84% down to 1,082 now from 1,174 last June. The average price for homes in New Hampshire increased by 6.41%. Multi families saw the largest increase of 15.55% going from $276,960 in June 2017 to $320,039 last month. Single-family prices increased 8.33%, now at $342,838 from $316,488, and condos increased by 4.54% from $232,039 last year to $242,564 this year. June 2018 is looking much like the May 2018 Housing report in that pending’s are down and listeds are up. The same factors are at play here; more homes on the market are taking longer to sell because buyers have time to be choosy. Buyers aren’t competing as much as they had to in the winter and early spring. Home sales showing a decrease this month isn’t too surprising, given that pending’s were down in May, and with them down- albeit slightly- again this month may mean that August may see a similar pattern. This does not mean we are suddenly into a buyers’ market but it is just not as strong of a sellers’ market as it was. We are seeing more of a need for price adjustments as homes are staying on the market for longer, so sellers should remember that the lack of bidding wars may mean their home isn’t going to sell as fast and for as much, and buyers should keep in mind that there’s not necessarily something wrong with a home because it’s been available for longer than what we experienced in winter.